Find three bowls of different sizes. My bowls ended up being pretty close in size so there wasn't a drastic difference between each layer. 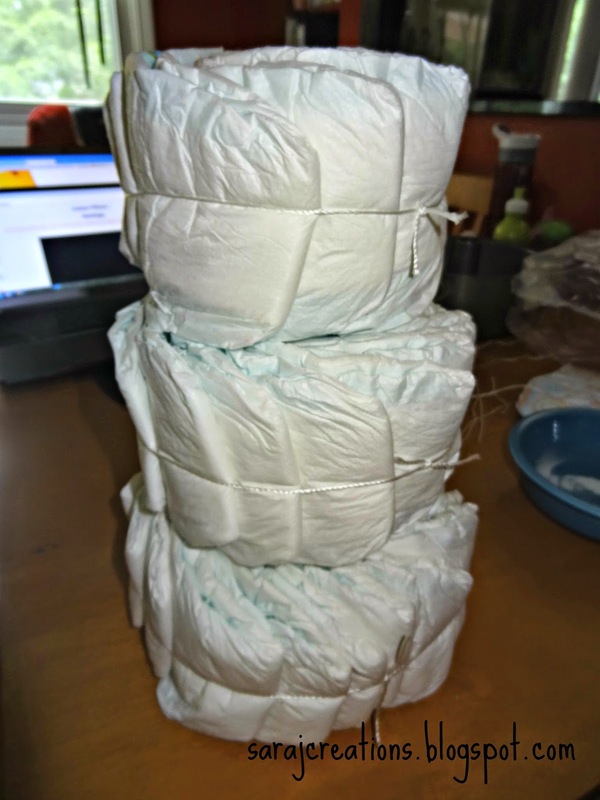 You can use any amount of diapers. It will just make the layers bigger or smaller depending on how many you have. 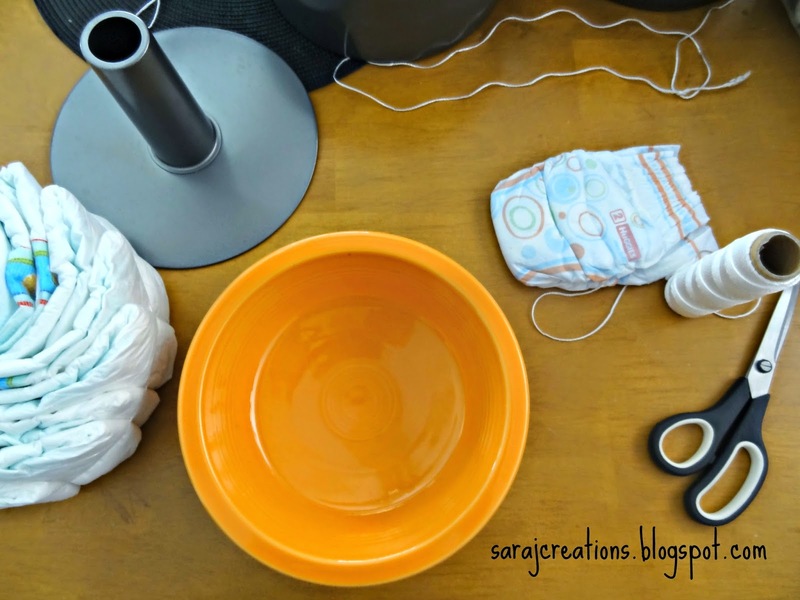 Put the diapers in the largest bowl (mine is an angel food pan) with the fold side out. 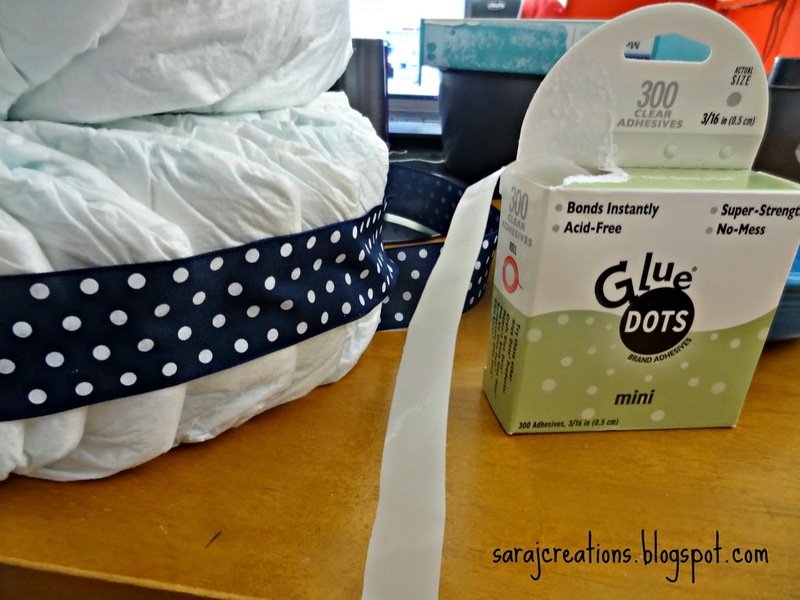 I don't know if this is one of those because I'm lefthanded things or what but I kept trying to do it the other way and then the flaps of the diapers were sticking out. Keep the fold side out and the flaps in the inside of bowl. If you don't have something round in the middle of your bowl, put the paper towel roll in there to keep a small hole. 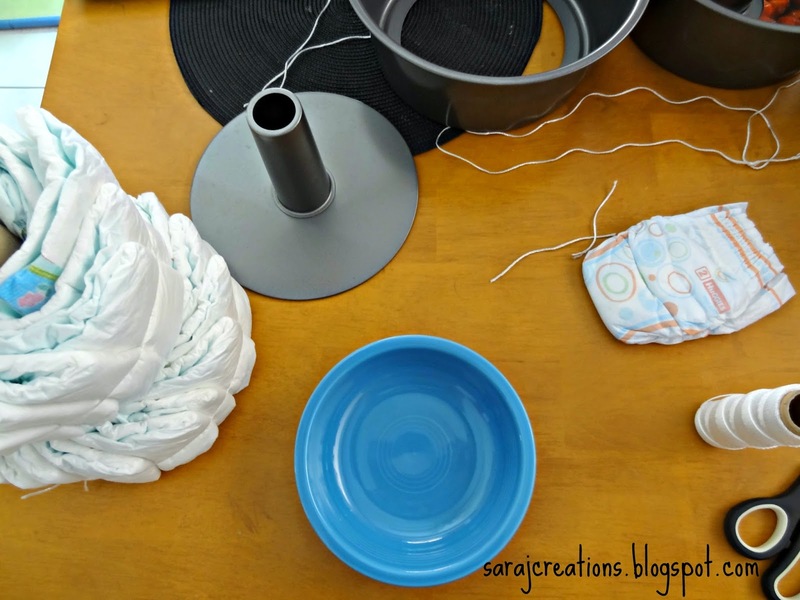 Put enough diapers in until the bowl feels packed. 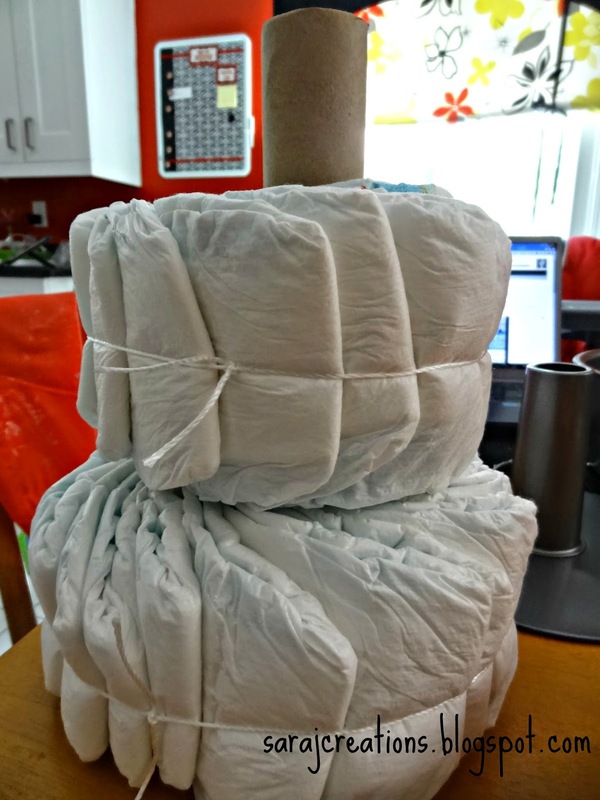 Because of the pan I used, the base could slide out with the diapers on it. I slid it out just enough to get the string around it. Tie the string in a tight knot and slide out of the bowl. Get your medium sized bowl (mine is a serving bowl for vegetables) and repeat the steps above. Again, use the toilet paper to help create a hole in the middle. This helps it keep the round shape plus will help with assembling in the end. 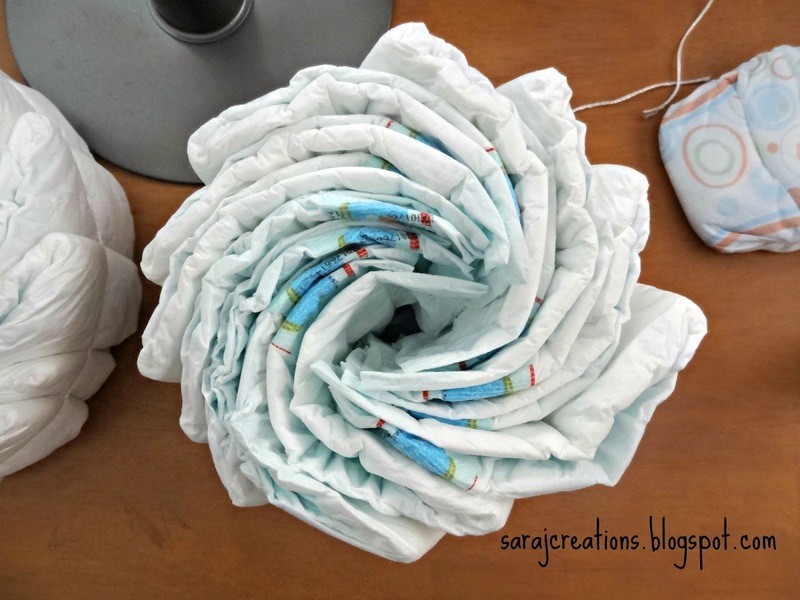 It can be a little tricky to tie the knot tightly without the diapers slipping out. 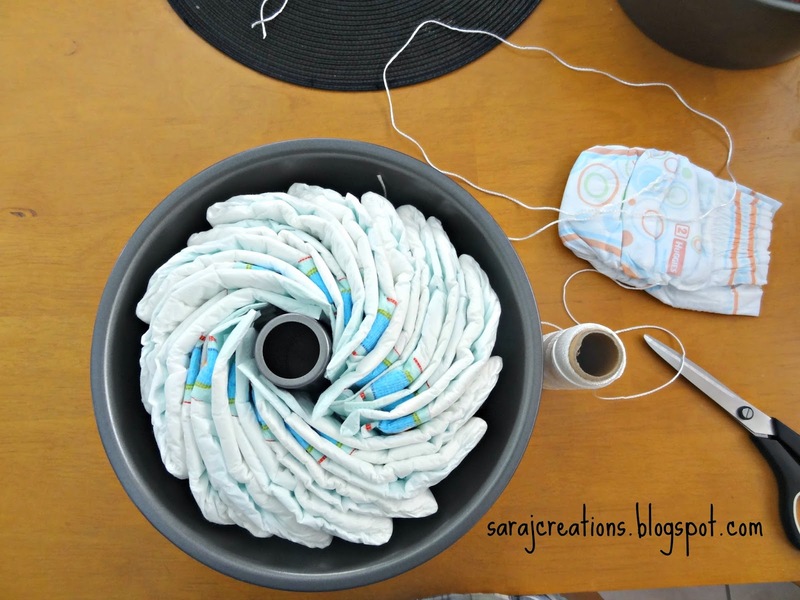 I found it easiest to start the knot while the diapers were in the bowl. 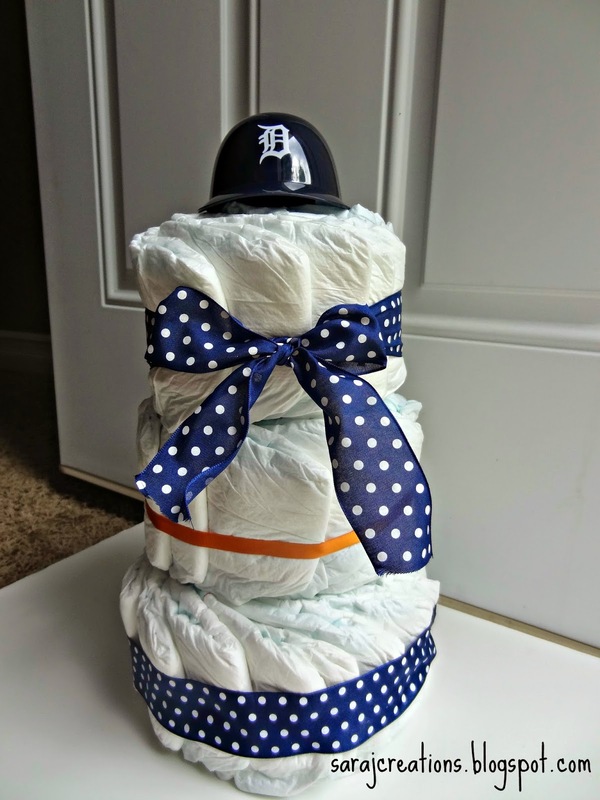 Then once it was secure, slide the diapers out of the bowl and tighten the string as needed. 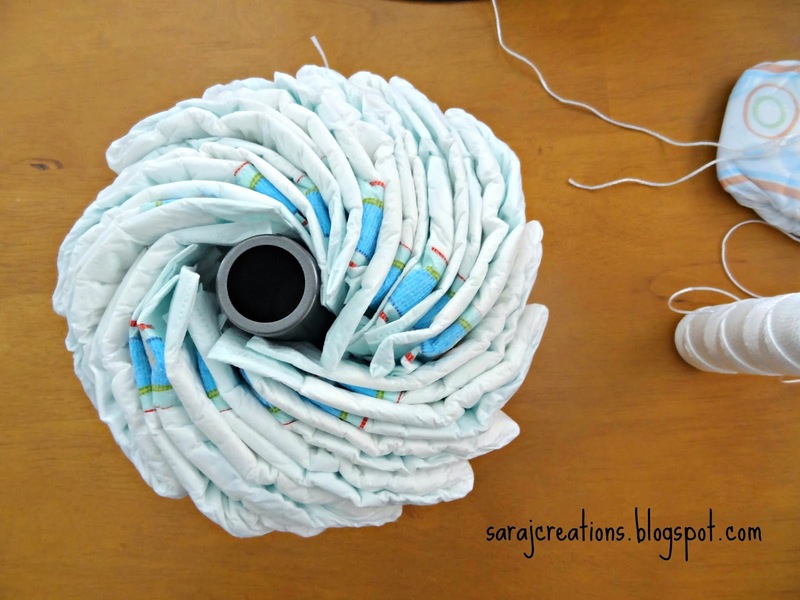 Yes, my diapers slid out of the string and I had to redo it. No worries. It doesn't take much time. Repeat the steps above in the smallest bowl. At this step, I was using our cereal bowls. They have a flat bottom which helped. 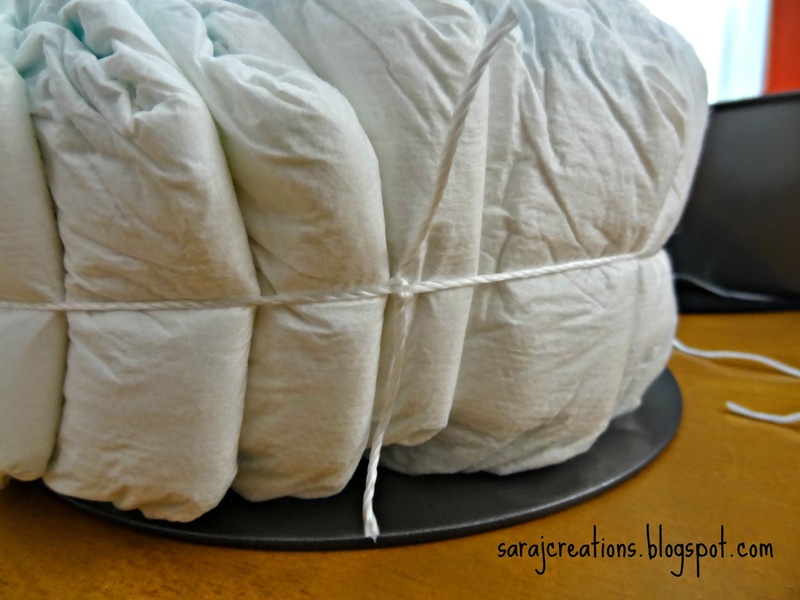 Use the paper towel roll to assemble the three layers together. 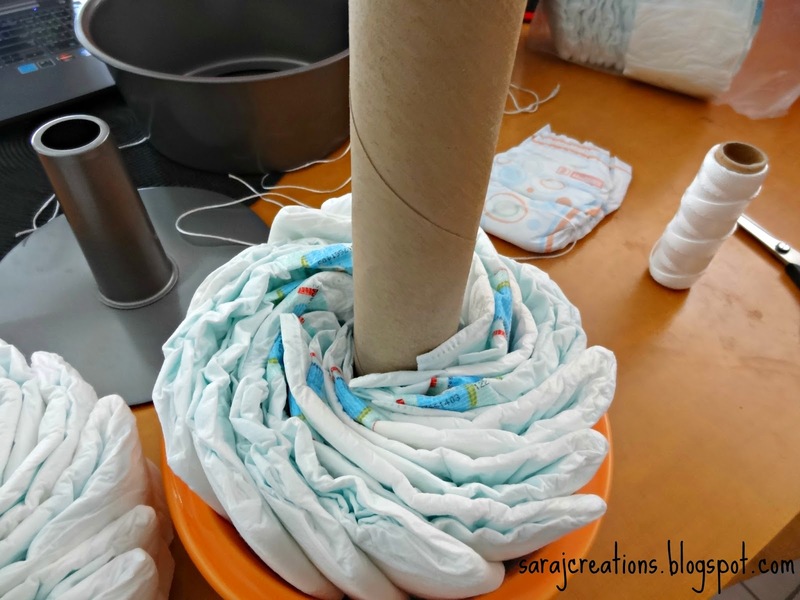 Mine was taller than the paper towel roll but it still went through all three layers and held them together without needing to glue anything together. Next, I used the ribbon to cover over the string. I just used glue dots to keep it on. You could use double stick tape, too. This was designed to easily come off but cover the string and add some color to the cake. For the top layer I added a bow with the ribbon. I balanced the baseball helmet on top. No glue. In order to make this easy to disassemble, it is not super secured. 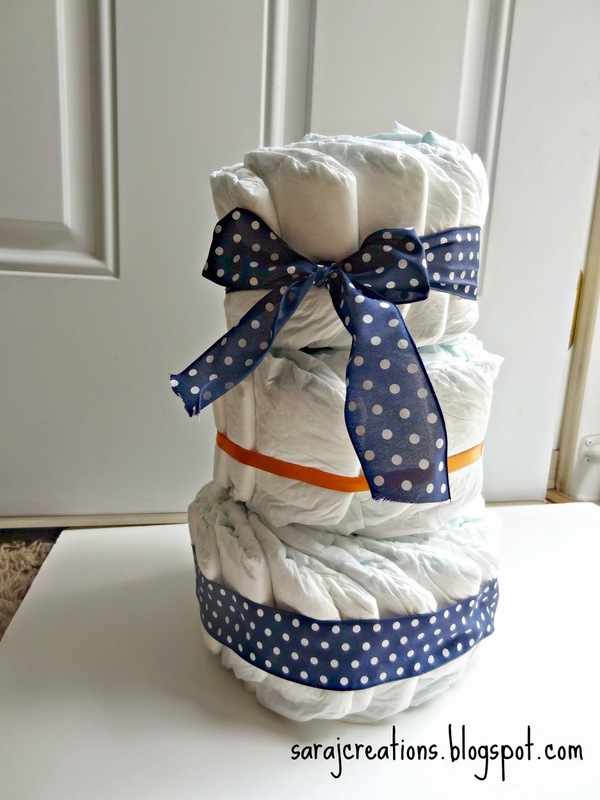 I could carry it from room to room after I made it and set it on the table at the shower. It definitely would hold up for that but I probably wouldn't ship this across the country without securing it more. Remember, my goal was to make it easy for the soon to be parents to disassemble it and use the diapers. There you have it. 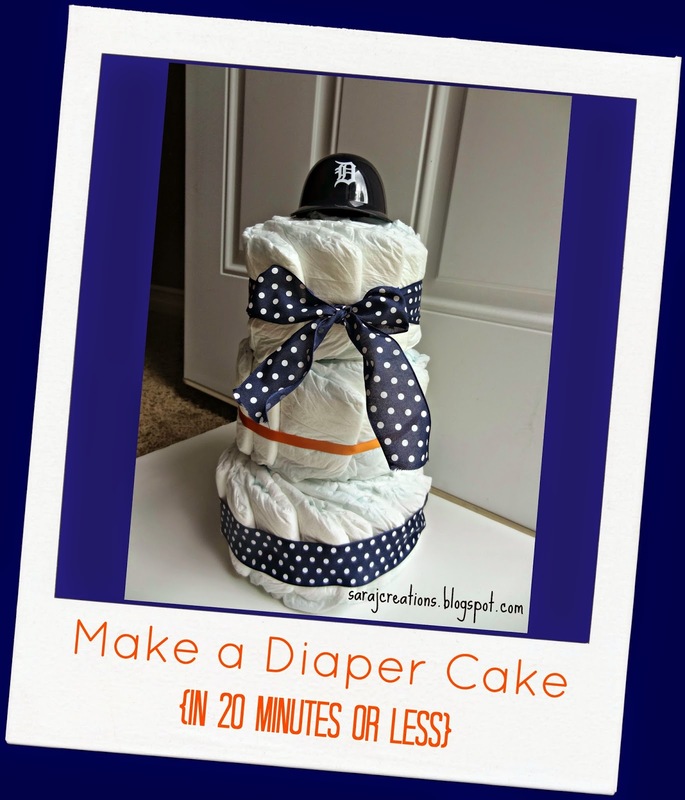 In less than 20 minutes you have a diaper cake ready to go! !